With all due apologies to Rodney King this is one question that many people don’t really struggle with simply because they follow their initial inclination to reach for that bottle of white. And that usually works out pretty well. So why mess with success? Let’s first try to understand why do we do that. There is the worn out cliché that whites should be paired with fish and reds with meat. I have fallen victim to this thinking– truthfully, there’s a little guy inside my head who bangs the drum for the white wine when aromas of fish seep from the kitchen. But, this seems so, what’s the word, prejudiced? And yet, who hasn’t had the experience of drinking a red wine that unfavorably enhances the fishiness of seafood? So why bother with reds? Well, while I enjoy the whites, I am not always in the mood for white even if I am having seafood. Also, not all whites do well with fish– think rich whites or buttery California Chardonnay. Having had some really pleasant experiences with red wine and fish, it’s time to think about what makes a red wine compatible with fish. In my experience, I have come across some combinations that really work. The first was suggested to me by good friend, B the Elder: Salmon & Pinot Noir. A second, by trial and error on my part: Garnacha and Tilapia, a white fish. A third, I wrote about back in June (https://sybaritesauvage.com/2011/06/09/no-guilt-wednesday-aia-vecchia-lagone-2007/) is smoked trout with a Tuscan blend of Merlot, Cabernet Sauvignon and Cabernet Franc. Still another suggested by another friend, who is very partial to Chilean Carmenere, is fresh tuna– the “other red meat”. I personally have not tried that, but it does show promise. Acidity. 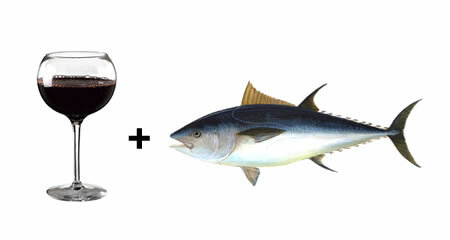 I think a key component in matching a red wine to fish is a key element in all good white wines– acidity. The Pinots that I enjoy the most, have that. Certainly, the Garnacha has that as well. My guess is that Barberas would also fit the bill. Cabernets– probably not so much. Not that some of these don’t have acidity, but not with the same level of intensity as the first mentioned varietals. Geography. A second hint that a red wine would work with fish is geography: Red wines that are produced where seafood is abundant are more likely to match up well with the local cuisine. The two examples cited above (Pinot Noir & Garnacha) fit the bill. In the case of each of these two suggested combinations, geographic coincidences suggest that the combinations would work. Whether by design or accident, I can’t say. Much of the best salmon comes from the Pacific Northwest, home to extraordinary Pinots. It would be natural, would it not, to seek to marry two crucial elements of that local culinary scene together. And the result is magical. But what about my recent discovery that Cannonau (aka, Garnacha) from Sardinia plays well with tilapia. (see https://sybaritesauvage.com/2011/08/19/sella-mosca-cannonau-di-sardegna-riserva-2007/) Now it seems that tilapia were originally found in freshwater areas of the Mediterranean. The fish were raised for food in ancient Egypt and have long been a staple of Mediterranean cuisine. Now, I can’t say based on this that Tilapia was consumed in Sardinia, but clearly, fish is a chief component of the Sardinian diet.